Welcome to Augusta Tomorrow’s history. 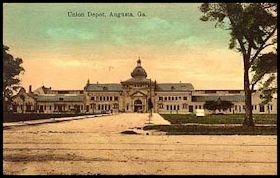 To put the Augusta Tomorrow history in perspective, it is important to provide milestones of Augusta’s economic development before Augusta Tomorrow was incorporated in 1982. Therefore, this history begins in the 1800s. 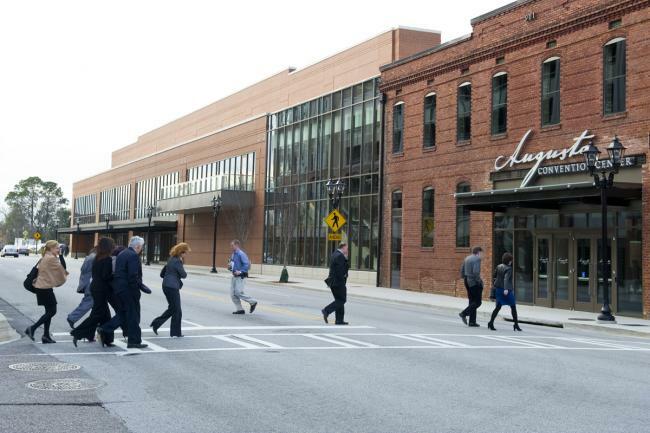 Augusta’s present downtown revitalization effort is one of many in the City’s long history. 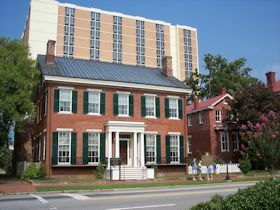 A notable early example was the response to the City’s economic slump in the 1830s – building the Augusta Canal System. In the 1950s, the automobile allowed for great mobility and Augusta, like many cities in the United States, saw a migration to the suburbs. In the 1970s, internationally known architect I. M. Pei was hired to spearhead downtown revitalization and to draw people back downtown. 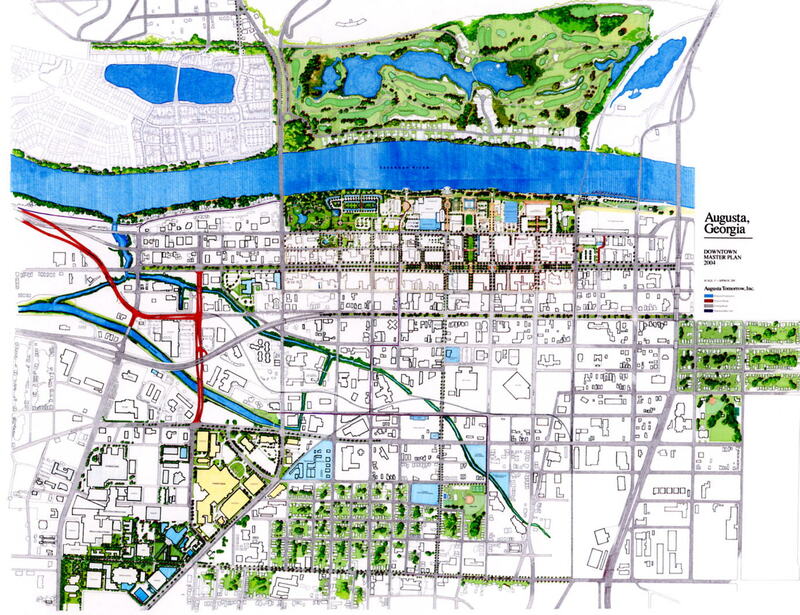 In the 1980s and 1990s, other Master Plans were developed. The 1982 plan focused on breaching the Augusta levee and bringing development to the riverfront. 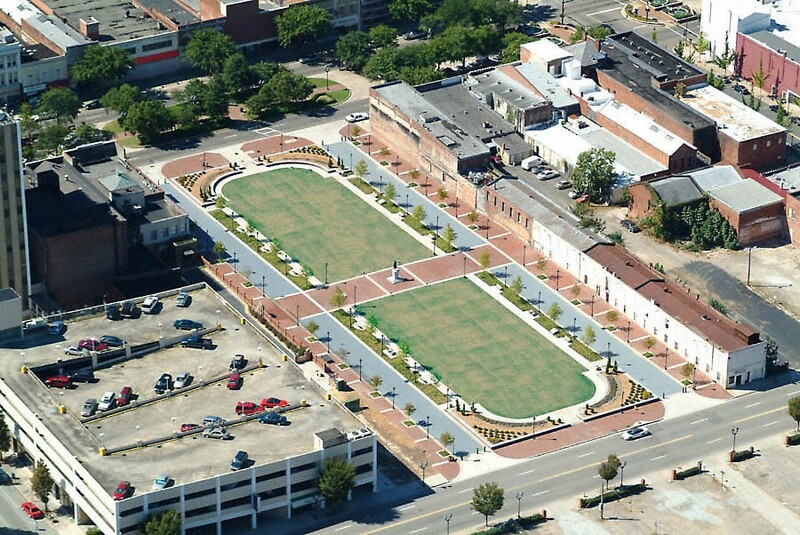 Subsequent plans worked on bringing the riverfront energy to Augusta’s main streets. The most recent master plan, the 2009 The Westobou Vision, for the first time included the City of North Augusta and proposed many wide-sweeping projects that are being actively developed today. 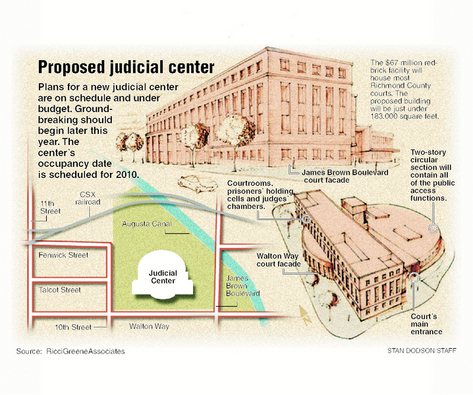 Augusta’s present downtown revitalization effort is one of many in the City’s long history. A notable earlier example was the response to the City’s economic slump in the 1830s. The solution – vastly successful – was the creation of the Augusta Canal System. The Augusta Canal system was built in 1845 and enlarged in 1875. This solution drew manufacturing such as saw mills, grist mills, textile mills (the big industry in Augusta until World War II) and ironwork factories to this new and substantial source of power generation – water. 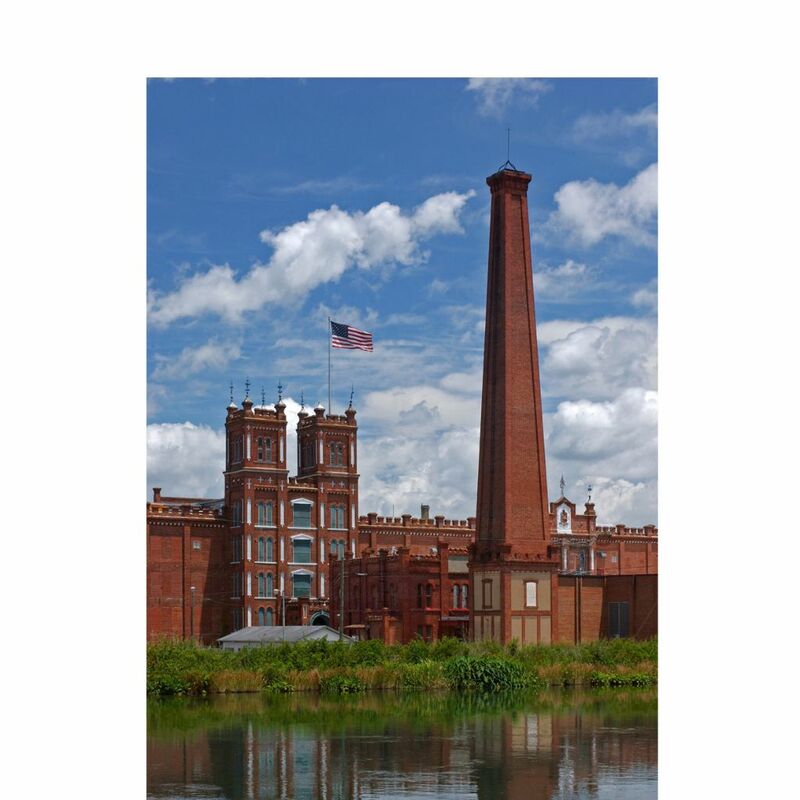 Therefore, this period in Augusta’s history saw the rise of mills along the Augusta Canal and the prosperity of manufacturing. 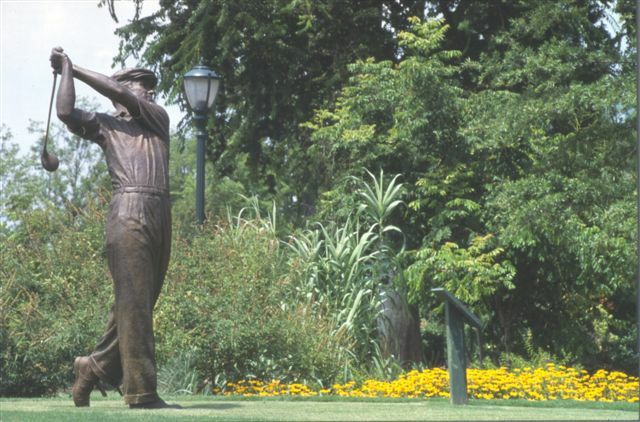 This period in Augusta’s history saw tremendous change. 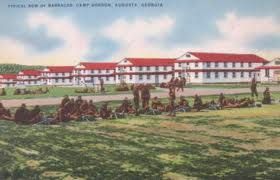 Not only was the Augusta Levee built and then raised to a higher level, Augusta won a bid for an army camp as World War II commenced. 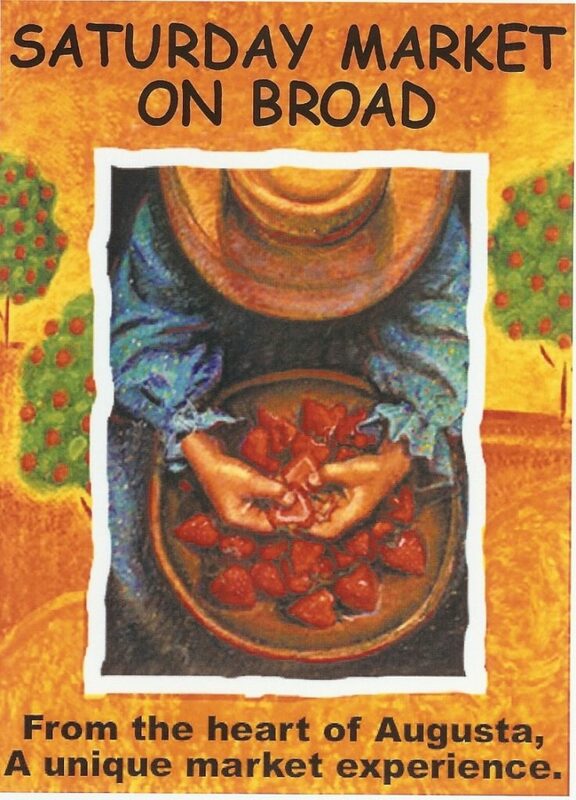 The automobile led to mobility and migration to the suburbs and a revitalization effort commenced with the hiring of internationally acclaimed architect I.M. Pei. 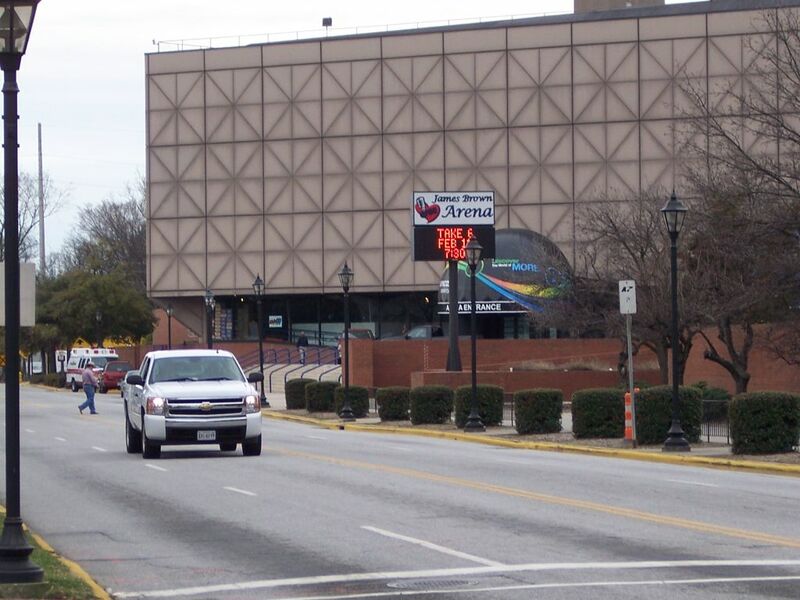 The emergence of the automobile during this time frame made a huge impact on downtown Augusta. 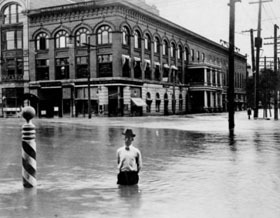 The flood of 1908 was devastating for downtown Augusta, and was the impetus for the City of Augusta to build a levee on the Savannah River as protection from future flooding. As a response to the 1908 flood, the City of Augusta constructed a levee that was completed between 1914 – 1916. 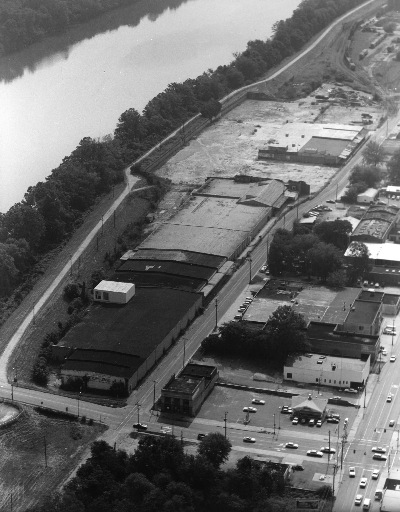 7/18/1968 – A Central Business District Study Committee adopted a $54 million three-stage revitalization plan to transform downtown Augusta into “a city unique to the nation.” This plan proposed developing a new civic auditorium, a river convention center, a monument mall on the 500 block of Broad Street, a cultural center along the levee, waterfront housing and a waterfront park. By December 1969, the Central Business District Study Committee had only one member, and none of the 1968 plans were implemented. 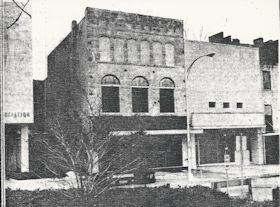 Although slowly declining since the early 1970s, downtown Augusta had remained the retail, cultural, banking, professional and social heart of the Augusta urban area. 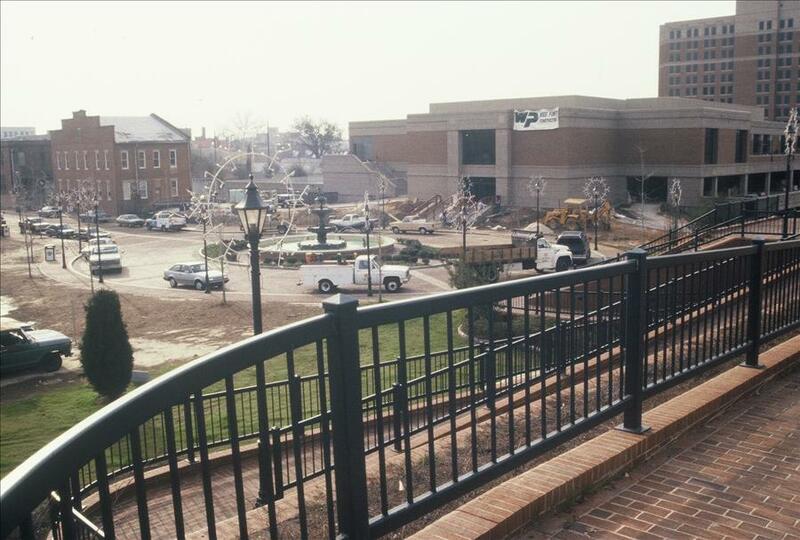 All of that dramatically changed after the opening of Regency Mall and Augusta Mall within a week of each other in 1978. With an excess of two million square feet of retail space between them and over 3000 jobs, the impact to downtown Augusta hit fairly suddenly with the debilitating effect of both major and smaller retailers and related services moving to or near the mall locations. Boarded-up storefronts and vacant buildings soon dominated the downtown shopping area. 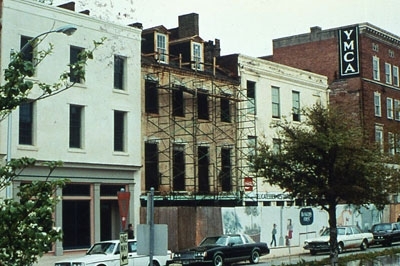 The consequences to downtown Augusta were, as with other cities before it, predictable: declines in property values and in the City’s tax base, declines in patronage of those merchants and other businesses that remained downtown, and a markedly decreased utilization of property and existing infrastructure (infrastructure such as streets built and maintained by the City and electrical, gas and telephone service built and maintained by the utility companies). Overall, a significant reduction in activity was accompanied by a growing deterioration not only in property use but in civic attitude and hope for the future of downtown Augusta. 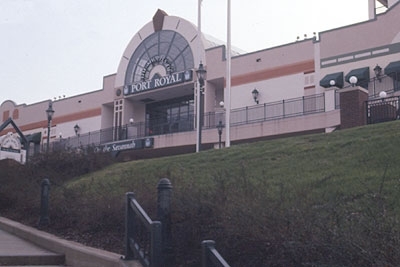 The malls and suburban growth phenomenon, while certainly not unique to Augusta, nevertheless occurred comparatively late in Augusta compared to the rest of the United States. The first mall opened in 1952 in Michigan. However, when it happened in Augusta, the consequences to the central city were comparable to those experienced by other American cities in the years between the end of World War II and the mid-1950s. Augusta was fortunate to have a forward thinking mayor (Edward M. McIntyre) and businessmen who envisioned the city’s revitalization. 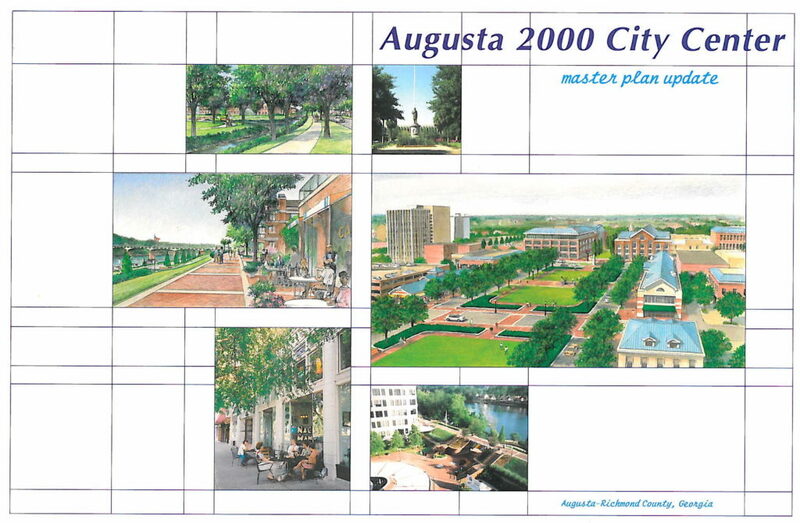 Discussions for Augusta’s revitalization began in the late 1970s and took a positive turn with the incorporation of Augusta Tomorrow in 1982 and a new downtown revitalization Master Plan unveiled in 1982. The Chamber of Commerce moved into the new I.M. 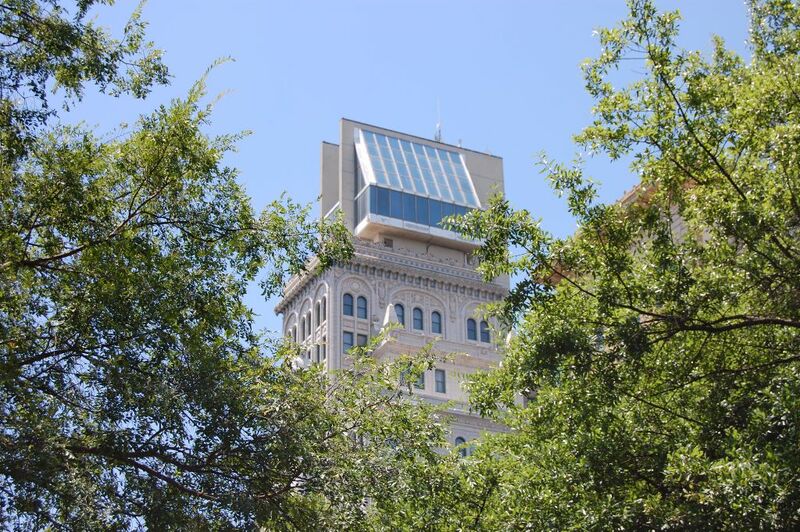 Pei designed modular structure built in the center median of the 600 block of Broad Street. 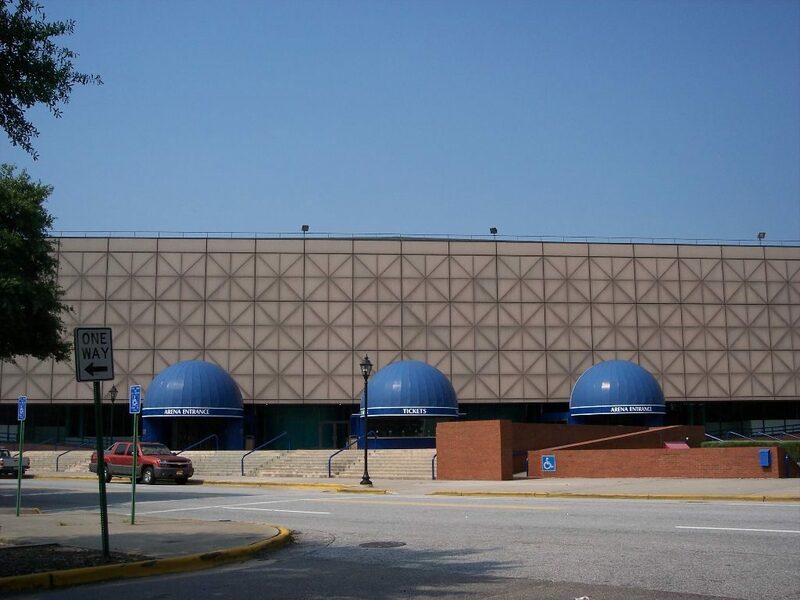 12/1979: Augusta Civic Center, later named the James Brown Arena, designed by Pei, opened its doors. Was it important for the community to have a viable central city, a traditional downtown, from an economic standpoint? Was the problem of decline as great as what was thought and what should be done with abandoned buildings? From conversations with urban experts and economists throughout the country, it became clear that it was critical to the well-being of the city to have an economically vibrant downtown. A deteriorated economically declining downtown served only to contaminate the rest of the community in economic, aesthetic and psychological terms. The community is best served when it is healthy throughout. 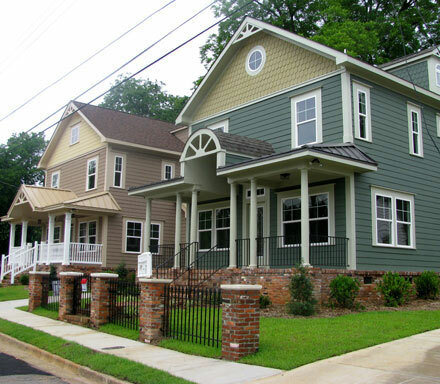 Would the historic preservation efforts and Historic Augusta alone achieve the degree of revitalization necessary to reverse the central city’s decline effectively and lastingly? 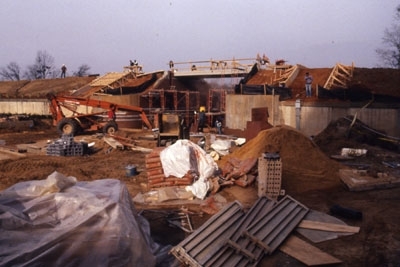 The answer was “no;” complex issues were involved which had to be dealt with through the application of manifold resources, public and private, focused directly on the various causes of the problem, even though preservation and restoration would remain an important part of the process. Early 1980s: During a realty conference in Savannah, Georgia, Connolly had a chance meeting with George M. Brady, Jr., a member of The Rouse Company’s board of directors. Brady suggested to Connolly a meeting with Leo Molinero to discuss Augusta’s potential for revitalization. 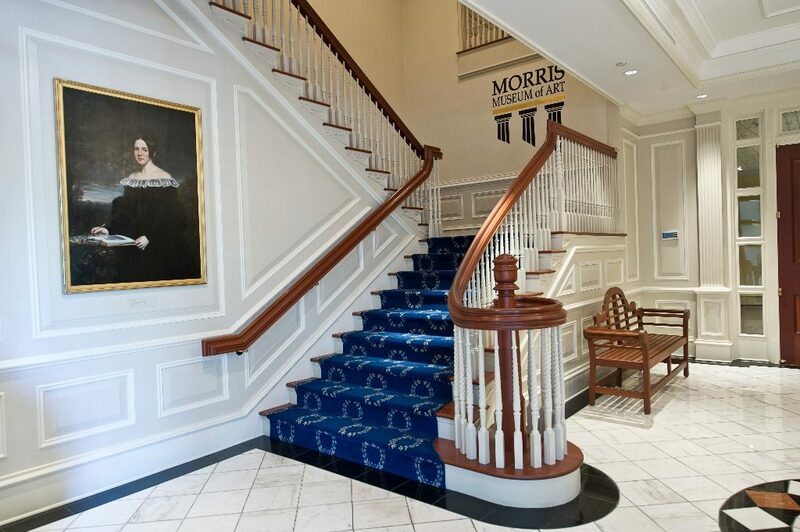 Molinero was president of American City Corporation of Columbia, Maryland and a wholly-owned subsidiary of The Rouse Company. 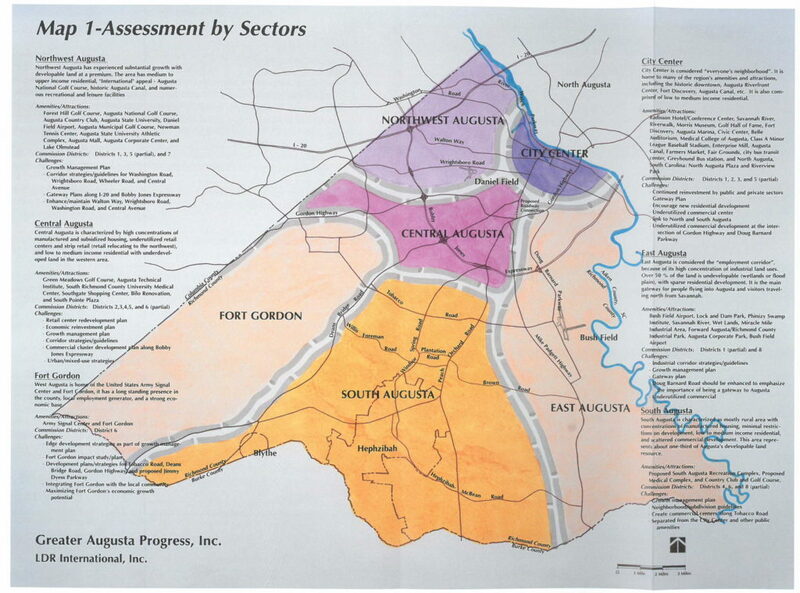 3/22/1982: The City of Augusta partnered with “Augusta Tomorrow” (then still a group of community leaders) and commissioned the American City Corporation, to conduct a six-month study of the entire downtown area and the riverfront and produce a viable plan for its redevelopment. 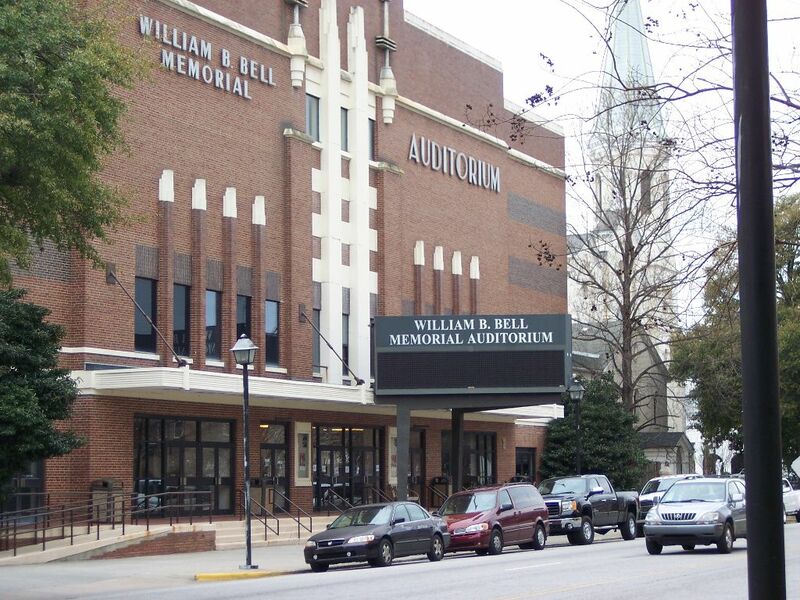 The $120,000 fee was paid ½ by the City of Augusta and ½ wholly by the individual members of Augusta Tomorrow. 9/22/1982: American City Corporation presented its $116 million plan, A Strategy for Downtown Development, to the City of Augusta and Augusta Tomorrow for downtown revitalization. The American City Corporation planners had studied all aspects of the city and found room for expansion and promotion of a medical complex, tourist attractions, historical sites and an economic base. But they also found problems – a downtown suffering from an image problem, little attempt to promote tourism, an inadequate effort to seek non-industrial businesses and too few convention facilities. 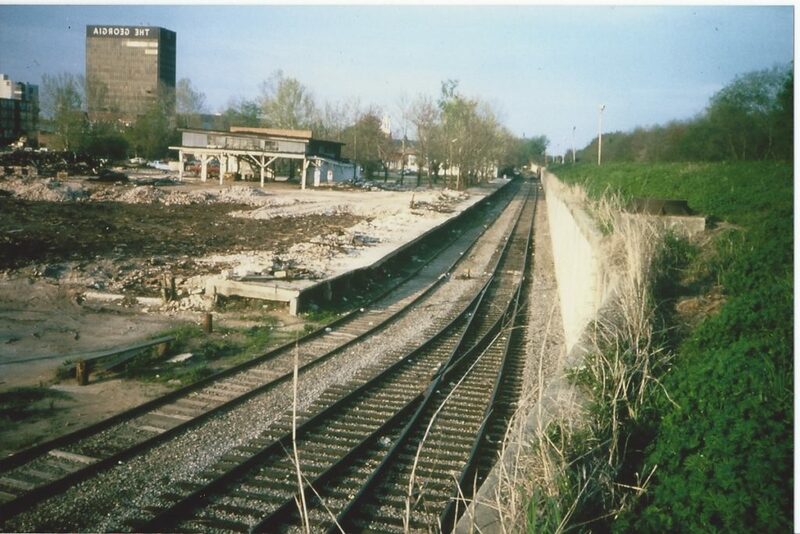 Two Conditions Precedent to Implementing the 1982 Master Plan – None of the initial master plan initiatives on the Savannah River could have happened without first satisfying two essential conditions – amending the federal 1899 Rivers and Harbors Act in order to breach the levee and removing the railroad tracks from the south side of the levee. 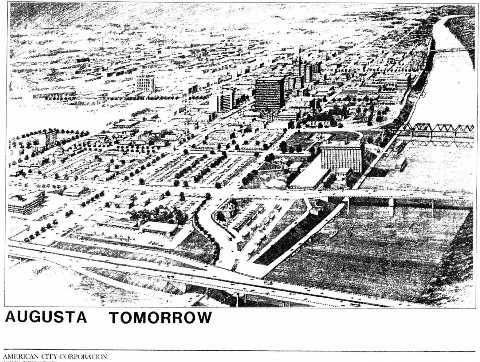 11/5/1982: Augusta Tomorrow incorporated as a non-profit, public and private sector organization designed to act as a catalyst for downtown development. 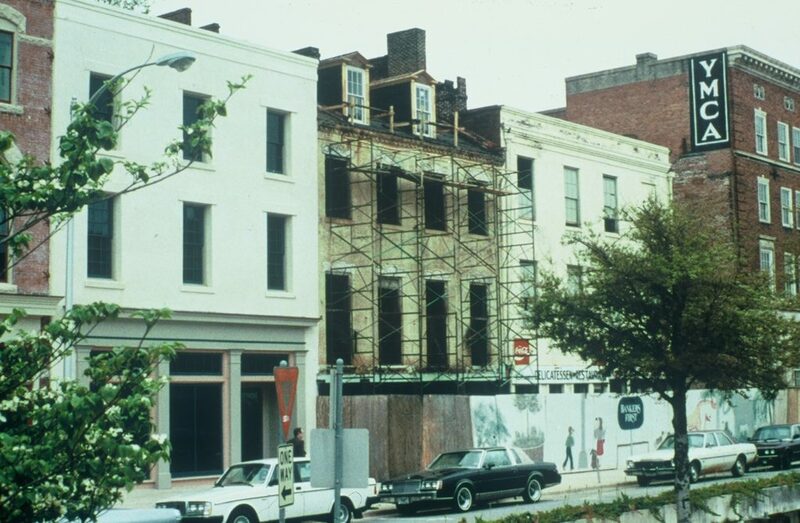 12/20/1982: Augusta Tomorrow jointly with the City of Augusta signed a contract with American City Corporation to implement the $116 million revitalization effort for downtown Augusta. The contract retained American City Corporation on behalf of Augusta City Council and Augusta Tomorrow, Inc. for implementation of the first phase of projects called for by the Master Plan. 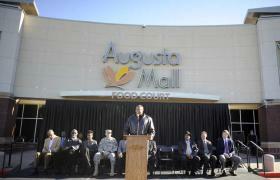 The one-year contract fee of $240,000 was paid ½ by the City of Augusta and ½ by the members of Augusta Tomorrow, Inc. Initial efforts concentrated on riverfront improvements to capitalize on the river as an amenity for all kinds of development. 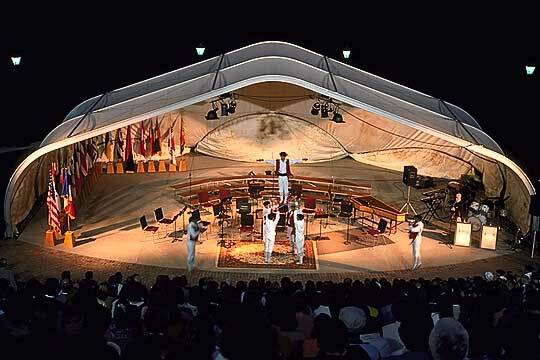 5/4/1989: The City of Augusta and Augusta Tomorrow, Inc. held a groundbreaking for the second phase of riverfront development that included building an 1800-seat amphitheater (later named the Jessye Norman Amphitheater), continued building both the upper walkway (esplanade) atop the levee and the lower walkway to the amphitheater. 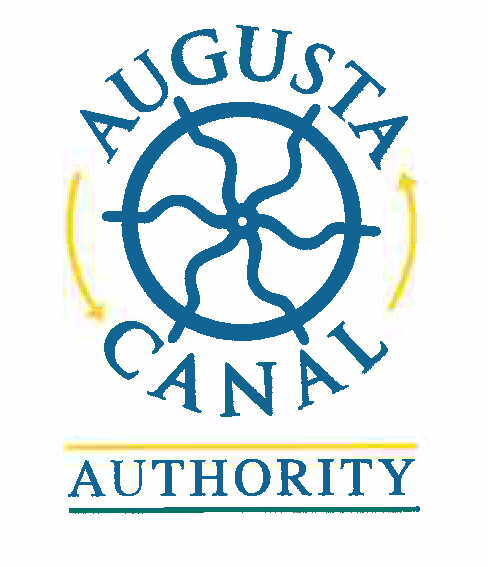 1989 – The Augusta Canal Authority was created by the Georgia Legislature. 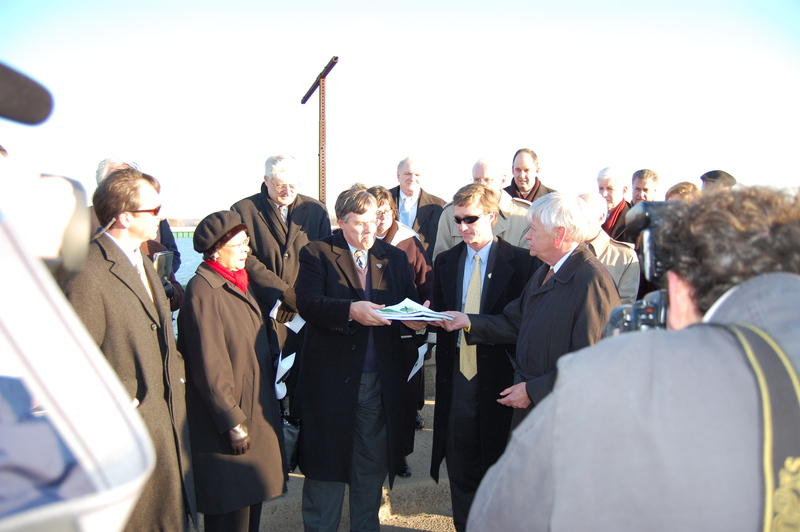 The Augusta Legislative Delegation proposed creating the Augusta Canal Authority and, largely through Representative Jack Connell’s management, resulted in the creation of the Augusta Canal Authority by the General Assembly. 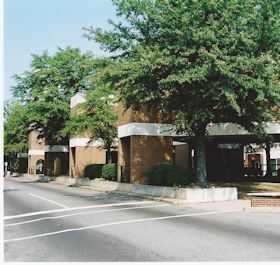 The legal cost for preparing the legislation was jointly shared by the City of Augusta and private members of Augusta Tomorrow, Inc.
2/1991: Due to the substantial progress and momentum achieved on the riverfront improvements, the City and Augusta Tomorrow, Inc. shifted emphasis to other portions of the Master Plan including implementation of the proposed Penny Bank Neighborhood Commercial Center on Laney Walker Blvd. 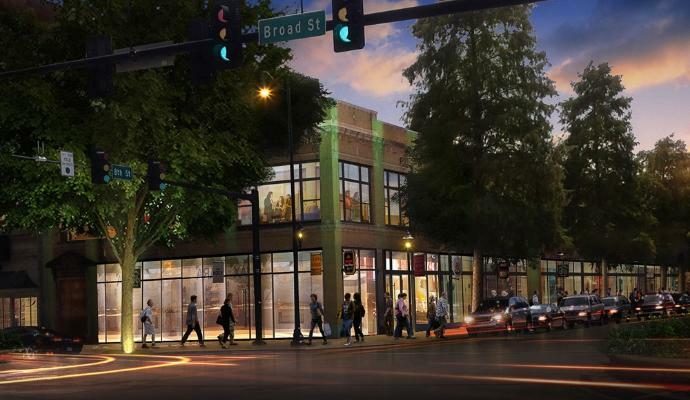 and various Broad Street projects. 10/1991: Across the river in North Augusta, a Flood Elevation Determination revision proposed by the Federal Emergency Management Agency (FEMA) to modify the 100-year elevation base for North Augusta took almost all of the South Carolina riverfront property out of the flood plain. The city of North Augusta had requested a revision to the flood plain elevations, and FEMAs revisions opened the way to riverfront development. 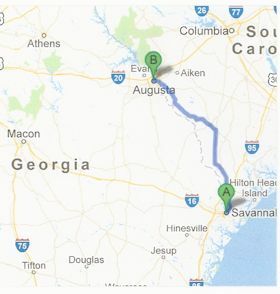 11/6/1991: Augusta Tomorrow sent a letter to FEMA requesting a review of the Savannah River flood elevations for Augusta, Georgia as development was hindered by the 30-foot levee on the Savannah River. A reduction in the flood elevation levels would allow development along Augustas riverfront, as it did in North Augusta. 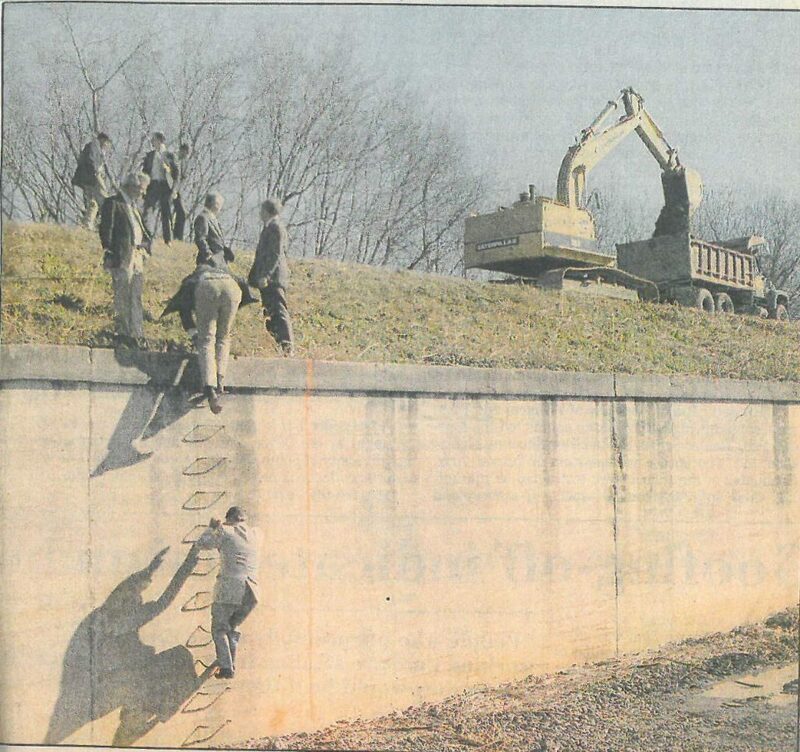 12/2/1991: FEMA denied request to revise the 100-year flood plain elevations for Augusta (just across the Savannah River from North Augusta) citing that the City of Augusta needed to pursue such designation with supporting scientific and technical data as a formal request to FEMA. 1/15/1992: Groundbreaking ceremonies were held for the Laney Walker Project, the Penny Savings Bank Neighborhood Commercial Center, on Laney Walker Blvd. 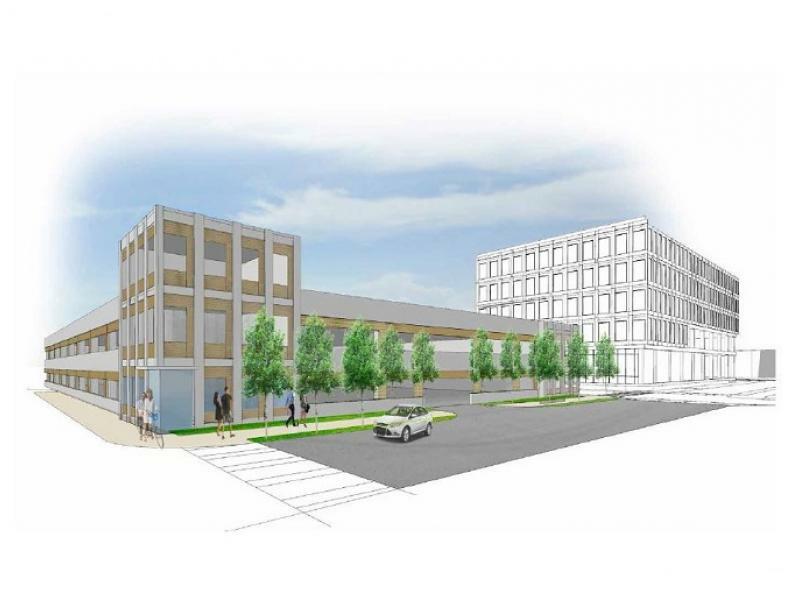 The Laney Walker Project was designed to provide a major commercial center with both convenience retailing and office space for minority owned businesses in the neighborhood. 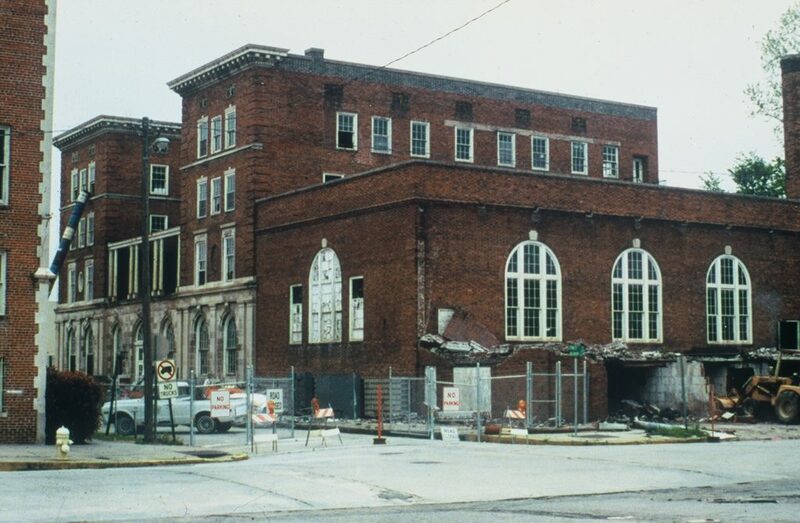 2/6/1992: The Augusta Riverfront Center was completed at One Tenth Street with the opening of a 234 room Radisson Hotel, a 25,000 square foot conference center, a 775 space parking garage and a seven-story 125,000 square foot office building with Class A office space, a portion of which became devoted to the Morris Museum of Art. With the development of this hotel and convention center, Augusta became a major player in the medium-sized convention business in the region. 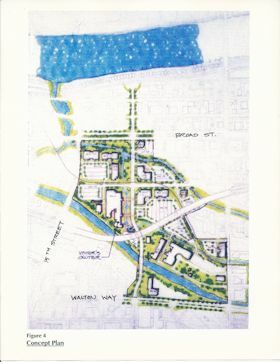 This was one of the implementation strategies in the 1982 Master Plan. 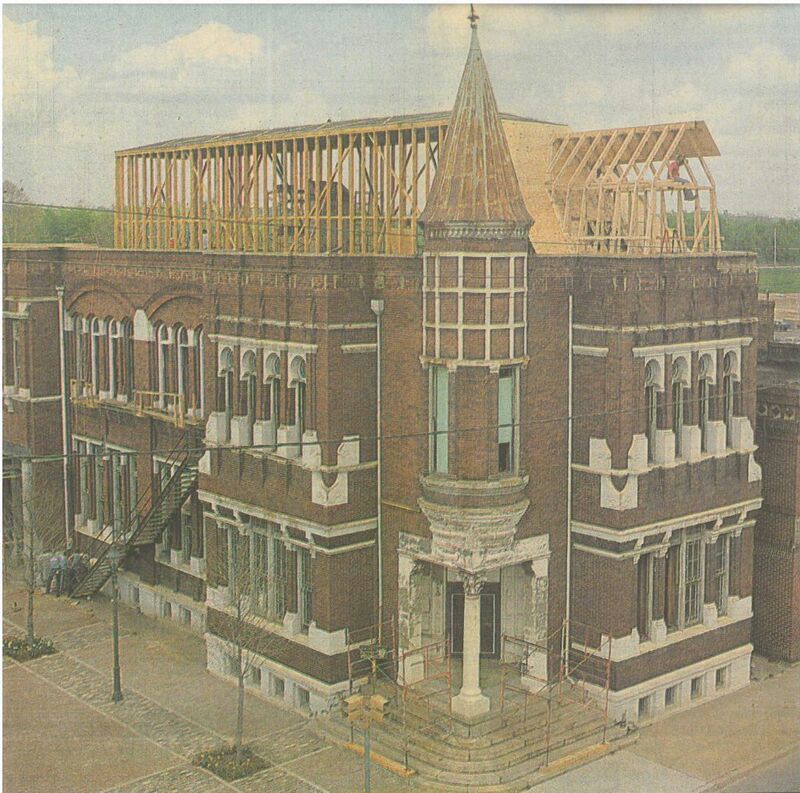 9/26/1992: The Morris Museum of Art at the Augusta Riverfront Center held a grand opening event. • The new 2000 Master Plan Update was unveiled in 2001. • Georgia Golf Hall of Fame had its grand opening in March 2001. 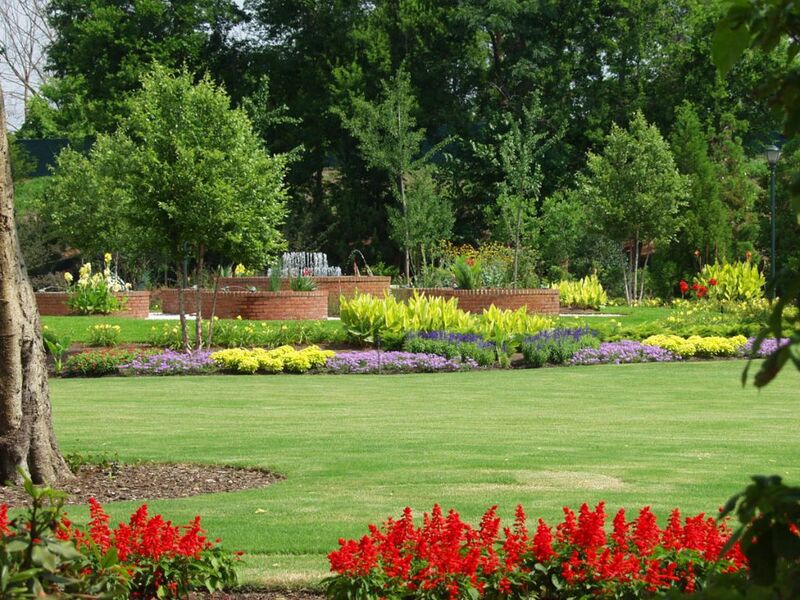 • Springfield Village Park was dedicated. 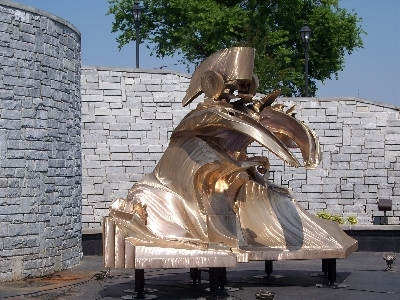 The sculpture, The Tower of Inspirations, sculpted by preeminent American sculptor Robert Hunt, was unveiled at the dedication. 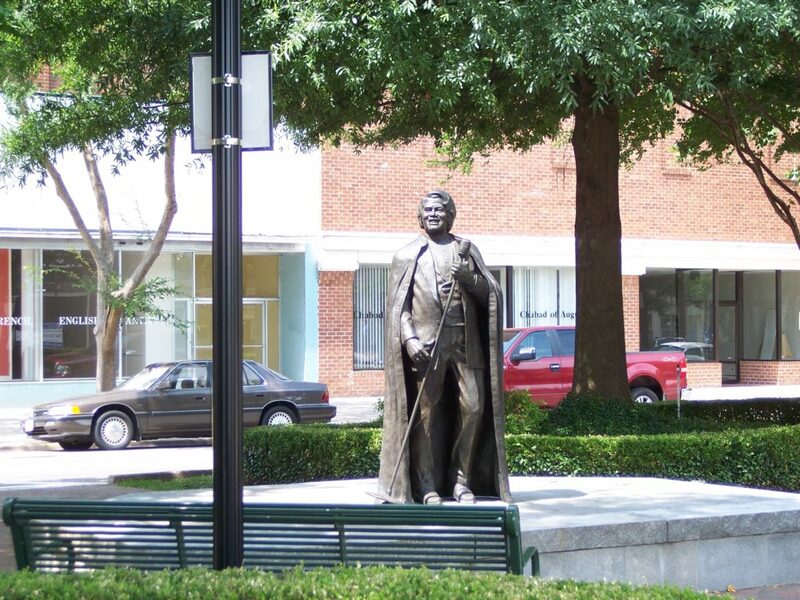 • A statue honoring Mr. James Brown was dedicated in the Broad Street Median at The Augusta Common. • The Salvation Army Ray & Joan Kroc Corps Community Center broke ground. • Six sculptures previously on display at the Georgia Golf Hall of Fame’s Botanical Gardens were moved to the Augusta Museum of History for display. 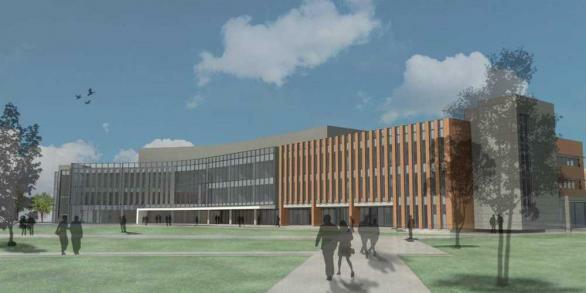 • Augusta Trade, Exhibit & Event (TEE) Convention Center broke ground. • New Richmond County Public Library Headquarters opened. • St. Sebastian Way roadway was completed. • Augusta Tomorrow, Inc. Gateways & Corridors Implementation Team unveiled beautification projects on Wheeler Road and St. Sebastian Way. • The Savannah River Parkway opened. • The grand opening of The Legacy at Walton Oaks on Sand Bar Ferry Road took place. 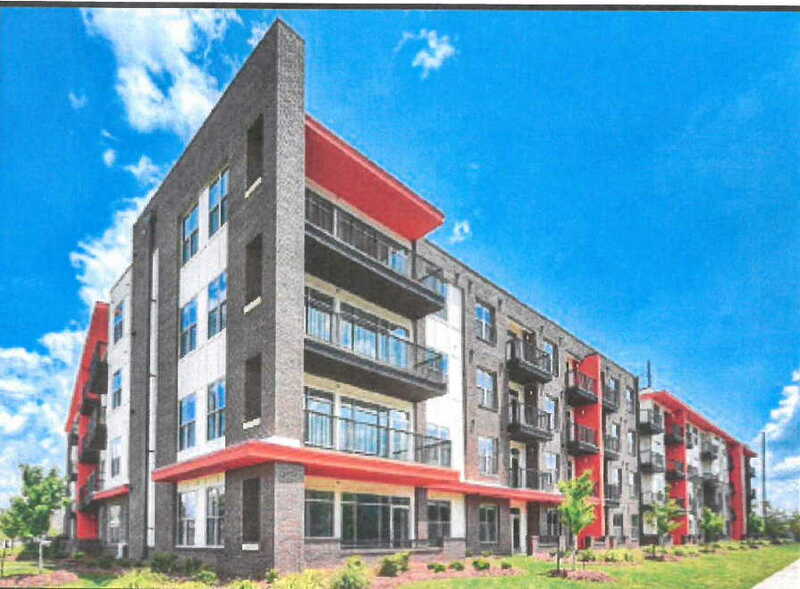 This new development replaced Underwood Homes. • After 16 years, the Augusta Canal Levee Trail is completed and boasts the only suspension bridge in this part of the United States. • Doug Barnard Parkway Phase II beautification completed. Start looking for 2018 history in January 2018. To view current and previous years, click on timeline ranges above.